Hi I'm Karl, I am licensed by the DVSA to give driving tuition and I am passionate about road safety. I currently live in Cranbrook with my girlfriend Sadie and our very lively labrador Jenson! We love living in the area and when I’m not working we like to get out and about and try and get him burning some energy! I became a driving instructor because I wanted a career with real satisfaction. Before training to become a driving instructor, I worked in retail for eight years. This has given me a great grounding with working with all types of people, and my leadership roles have given me an immense amount of experience coaching and training. 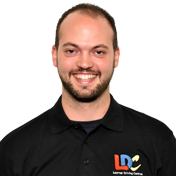 I completed my instructor training with LDC and have chosen to work with them because I believe in their system - everybody is different and the LD System allows for flexibility in lessons so that you learn to drive safely at a rate that suits you. I aim to make every lesson enjoyable and as productive as possible. The LD System just helps me to do this more effectively. I will always do my very best to make you feel at ease during lessons as I feel the learning environment is so important to the progress you make. I hope this gives you a brief idea about me, if you’d like to know more then please feel free to "Contact me"